More than 3,000 Mountain Bikes will be used by Scouts participating in Extreme Sports. BSA photo by Shane Noem. Extreme Sports "could not be more different from the last jamboree," explains Kim Carson, the area's administration and public relations officer. The Summit Bechtel Reserve's all-wheel-based adventure areas are professionally-built and ranked tops in the world. Included in the Extreme Sports category at the 2013 National Scout Jamboree are BMX biking and mountain boarding (at The Trax), skateboarding (The Park), mountain biking (Low Gear and High Gear), and disc golf. These facilities are worth over $6 million, staffed by over 300 volunteers, and are built by Spohn Ranch or Gravity Logic. Carson, a Greensboro, N.C., native, recalls the mountain bike course at the 2010 National Scout Jamboree at Fort A.P. Hill, Va. It was essentially a grassy hill, a stark contrast to this year's course, which is the number one purpose-built facility in the world according to Carson. 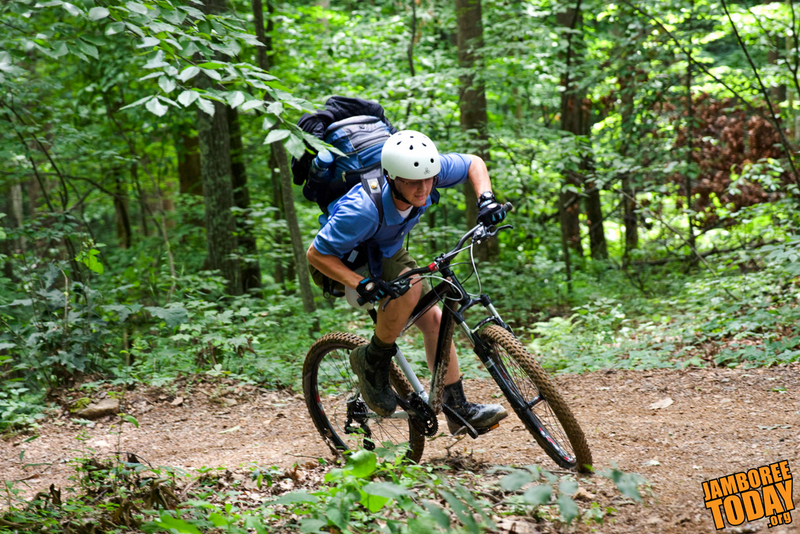 The High Gear and Low Gear mountain biking areas each offer hours of activities for Scouts. These areas have been built to accommodate a range of beginners to experts, Carson says, and are not reserved for the elite or highly trained. She also says that individual skill levels will be assessed at each activity, and Scouts will be directed to either beginner, intermediate, or advanced level areas at each site. "Don't be afraid to try it. It's built for kids to learn on," she says. Before you jump out of your tent and catch every Extreme Sport, there are a few things to keep in mind. Participants will need to stay well hydrated to enjoy the activities, so bring ample amounts of water – not only for the activities, but also for the long walks out to many of the sites. Additionally, participants should be sure to check any specific regulations for the activity. Overall, Eagle Scout Michael Hardebeck, the Extreme Sports team leader, emphasizes that everyone is encouraged to try a new activity, regardless of prior experience. "It's the perfect home for adrenaline junkies for any skill level. Start small, go big, get wild," he says.